We walked into this cosy pub in the heart of beautiful Chipping Camden where a warm welcome was chirped from behind one of the six hand pumped beers. I thought as we entered, we have stuck gold looking around this low-beamed bar complete with a roaring fire but best of all was the fabulous smell of something delicious being cooked in the kitchen. On first impressions it seemed impossible to not love this Cotswolds village inn; please don’t let the food change our first impressions. The Eight Bells was a welcome relief after only 50 yards from here we first stumbled into the Lygon Arms, which may be a popular Racing UK venue, but the menu and atmosphere was less than enticing. We found a table and considered as we were dining at 8.00pm at Charingworth Manor later and it was already 2.00pm we order a lighter lunch of sandwiches, but could not resist a portion of their chips. The decision to choose sandwiches was not an easy one whilst we watched our fellow diners tuck into a huge Lamb Shank and Hook Norton Beer Battered Cod but we stayed strong. We ordered a couple of pints of the aforementioned Hooky from Hook Norton the pubs most local brewery (about 20 miles east) and what a great pint of golden and maltyness. The pub is lovely and we pleased to have found a seat across from the a roaring fire. Did you know that Hook Norton still deliver to some local pubs by Shire Horse and Dray? If you in the area it would be worth checking the Hook Norton site to see if you can see these beautiful horses in action. 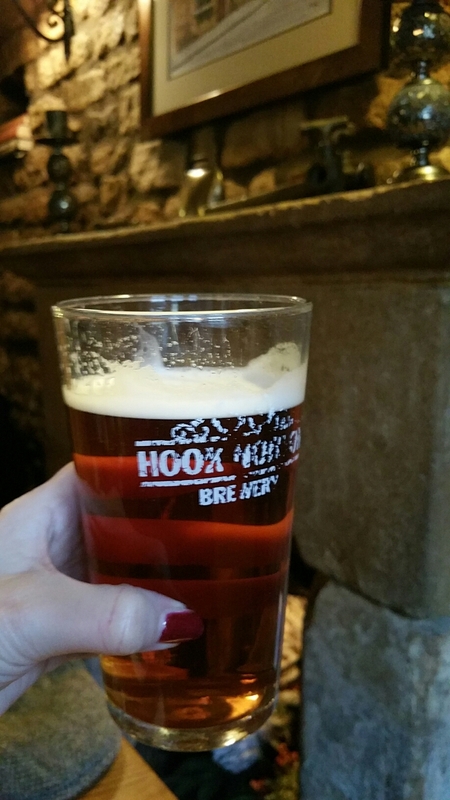 This inn was busy with a gentle hum which felt very calming or maybe it was the pint of Hooky giving the soothing effect – either way we had found a real gem in this corner of the Cotswolds which has a fabulous atmosphere. Our lunches were served and both were presented neatly with no fuss or garnish on the plate. I’m never sure how I feel about a lack of green on a plate but in the interests of zero waste I trust the Chef to waste any leaves (I hasten to add you can top your order for an extra mix of salad and chips). The chips were golden and tasty – crisp on the outside and fluffy on the inside. 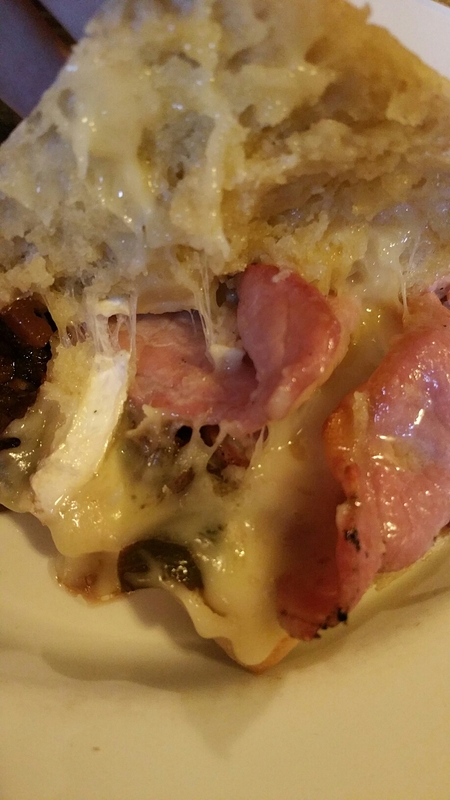 David loved the Brie and Bacon Ciabatta as it had a great balance of filling to bread and was oozing with hot creamy brie over thick slices of quality back bacon. What was unexpected was the apple chutney which really added to the mixture and made this creamy, meaty sandwich a ten out of ten for him. The rare roast-beef, was as ordered rare, all too frequently we are promised this but served overcooked but not today. With lots of peppery rocket, and sweet and spicey horseraddish all in a crunchy ciabatta (did you know ciabatta was commercially only introduced to the UK in 1985 by M&S). This was looking good and it tasted good too but the beef was fighting for its place in the flavour race as it was quite thinly sliced. It was a real shame as they advertise the sandwiches as hearty. On a positive the beef was tender and of good quality. Just more slice of beef for the £7.95 would have seemed fairer and given a perfectly filled and balanced sandwich. The bill was just under £27 for the two of us before a tip so reasonable value. We really enjoyed our visit to the Eight Bells and next time we are going to Cheltenham we will definitely make a point of calling in and trying their main courses. If we are organised enough (this pub has 6 gorgeous en-suite rooms which book fast) we would like to stay here so we can sample some more of their excellent kept beer. So if you are a regular visitor to Cheltenham races I would recommend you put this lovely 17th century inn on your list of considerations, with its beautiful setting and 4 star rooms and a concise and varied menu that is reasonably priced oozes confidence .